We have been asked if the American 99ers Union was going to release a form letter, that would be used when contacting House Reps with respect to H.R. 589. The answer is yes and it shall be posted on the American 99ers Union website as well right here at DAWU later today. The American 99ers Union was asked early on to provide a letter of support for H.R. 589, which was and is being used by Rep. Lee's Office as a tool to garner support for the bill. From a marketing perspective, it is suggested that we keep putting the name out to House Reps as a show of unity and organizaion on the part of the 99er Community. This also emonstrates our continued working relationship with Rep. Lee. Please understand that this is not about ego, rather good business. 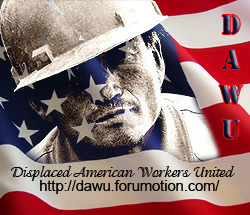 NOTE: The American 99ers Union is pleased to announce our newest group member, Displaced American Workers United. The logo (sadly not the graphic due to sizing issues) and link can be found on the A99U site and the logo will appear on today's action letter.